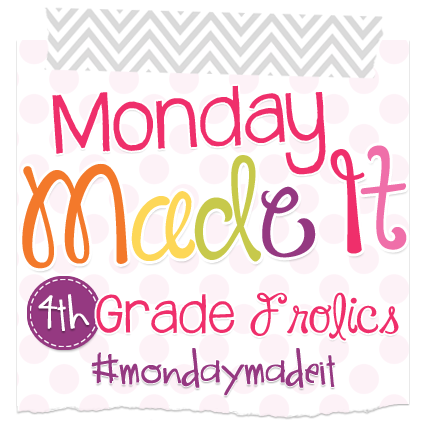 I'm so excited to link up with Tara from 4th Grade Frolics for her weekly linky party of Monday Made It. This is week 6 in the summer for the linky party, but it's my first time linking up. Ever. Not just for the summer, but ever. You'd think I never make anything or something. I do. I really do. I just apparently never blog about it. My classroom is a sweet shoppe theme with the main colors as hot pink, teal, and black so these scrapbook papers will fit in perfectly. I have a pretty teal shelf that they will look beautiful on. Don't worry- I'll show you when I set up my room for the school year. I'm sure you know where I'm going with this post. Letters, scrapbook paper, Mod Podge. Yes, I'm going to Mod Podge the scrapbook paper to the letters. That was all I had planned. Then I started thinking about the sides and how I didn't want the sides to be plain brown. So, I busted out my pink spray paint! I love spray paint. I painted them front and back. Honestly, I didn't need them painted on the front. I got a little carried away. I was having fun. Also, make sure you trace your letters onto your scrapbook paper before you spray paint. After the letters were dry, I began applying the Mod Podge to each letter. The Mod Podge needs to be completely smooth, not bumpy like it is in this picture. Then, you apply the paper. Once it is positioned where you want it, you smooth it down. Then, add some more Mod Podge. That's it! Thanks for checking out my new little craft! Can't wait to put my letters inside my classroom! They look amazing - especially like the R! These turned out so cute! Definitely on my summer made-it list! :) Thanks for sharing!